To promote ethical and moral responsibility in shaping its graduates, Rose-Hulman Institute of Technology created a sustainability initiative to reduce its own environmental footprint. As part of that team's efforts, Six Sigma students at Rose-Hulman conducted a project to reduce food waste at the campus dining center. We got the opportunity to learn more about the project by talking with Dr. Diane Evans, a Six Sigma black belt and associate professor of mathematics at Rose-Hulman who led the students’ efforts, and Neel Iyer, a mechanical engineering student who was also on the project team. According to a July 2012 article in Food Policy, U.S. food waste on the consumer level translated into almost 273 pounds per person in 2008. Evans’ students converted this number into pounds per day, and to determine the amount of waste per meal, they divided the figure by 2.5 meals per day (they did not count breakfast as a full meal because it typically does not see as much waste as lunch or dinner). The students ended up calculating an average food waste amount of 4.78 ounces per meal. The students used the define, measure, analyze, improve, and control (DMAIC) methodology to manage and complete the project. As part of the define phase, students developed process maps using Companion. 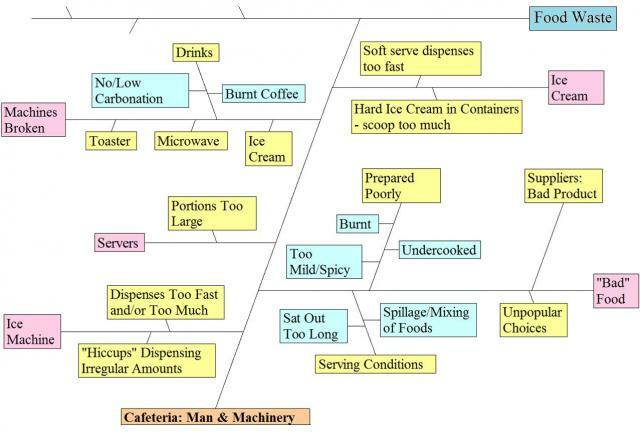 The process maps helped them understand the current flow of students through the dining center, as well as where potential improvements could be made. In addition, they created a ‘Critical To Quality’ or CT Tree to quantify the students’ expectations for their dining experience and to visually connect the students’ needs to the goals of the project. This tool allowed them to verify that sustainability issues were a key concern to students, who wanted their school’s dining room to be environmentally friendly. With the process defined and the key causes outlined, the project entered the “measure” phase. The students collected baseline food waste data in order to establish the current capability of the process. They conducted a food audit to form their data set, during which class members stationed themselves at the food disposal area of the dining center. After students finished eating, class members collected their trays and scraped and dumped uneaten food and liquid into a bucket. Then the weight of the food waste was recorded. 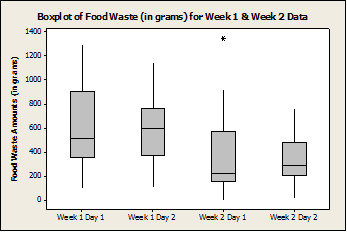 Using control charts, the students determined that the lunch-time waste process was “in control,” and that there were no unusual points or outliers. For each process input from the group’s current-state process map, they constructed a C&E Matrix, with outputs based on those already listed in the CT Tree. The C&E Matrix helped the students to determine likely relationships between process inputs and outputs, and conducting an FMEA gave them another tool to identify and prioritize the severity of potential causes of waste. Now the project entered the “improve” phase. The students formed a list of recommended actions based on the variables they could control and the short time frame they had to complete the project. These actions focused on educating students about food waste using posters, demonstrations, and seminars at the dining center during lunch hours. 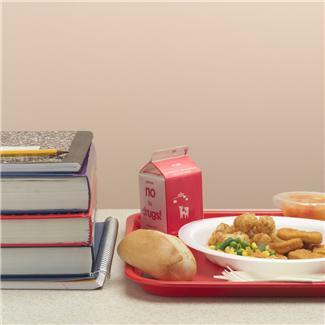 They also suggested that dining room staff provide students with smaller serving utensils for condiments, pre-dish more foods, and limit how many glasses and bowls of food or drink students could take per tray. After the awareness campaign, the class performed a second food waste audit to determine the post-improvement process capability. 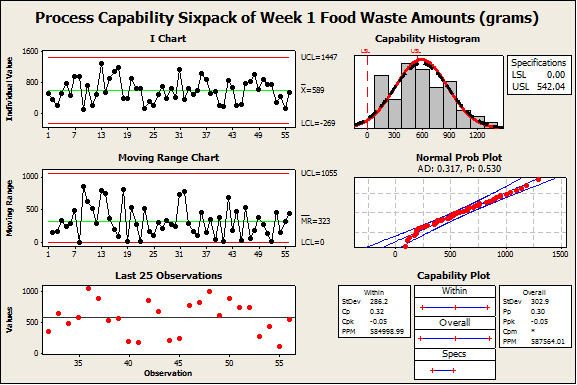 They were able to show that the process was still capable with respect to the national average, and after providing students with food waste education, they found the process capability had improved over the capability analysis conducted before the education intervention. Further analysis of food waste data collected before and after the campaign revealed a statistically significant difference in waste amounts. The class’s data found an average reduction of 2.66 ounces of waste per person/meal (or 0.166 pounds per person/meal) after the campaign. Because the dining center typically serves about 875 students per day during lunch, the class estimated that the center could see a waste reduction of approximately 2,327.5 ounces, or 145.4 pounds during a single lunch period. Over the 50 lunch periods in a typical quarter at Rose-Hulman, a total of 7,270 pounds of food waste could be saved. And since food waste costs the dining center$1.60 per pound ($0.10 per ounce) on average, the class calculated a savings of $471.20 during just the two days they held the food waste campaign and collected data. If the campaign were run over an entire quarter, they estimated total savings of $11,781!